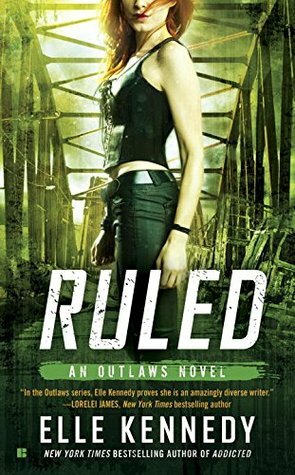 I’m used to a level of hotness in Elle Kennedy’s books, particularly this Outlaws series but dang she took it to a whole new level in Ruled! First things first though. *disclaimer voice* Ruled has m/f/m and m/m love scenes. *end of disclaimer voice* I enjoy them as long as they’re well written and serve a purpose, which duh, this is Elle Kennedy I’m talking about here so of course they serve a purpose and as a bonus they’re really hot scenes. 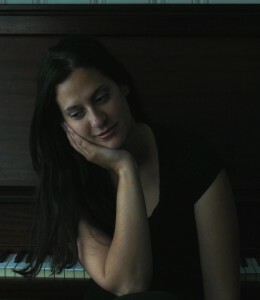 Elle Kennedy has been the only author of adult Dystopian Romances that I can truly enjoy. She doesn’t drag women back to the caveman days where they’re totally dependent on the protection of men and are constantly cowed by them. Nope, not Kennedy. She instead creates kick a$$ characters like Reese who not only survive in the outlaw clans, they can rule outlaw clans just as well as the men. As a woman leader, Reese had to be twice as tough and confident and while she was tough, she also cared about the people under her command and understood that they placed a lot of trust in her ability to lead and keep them safe. So whenever Reese had to make decisions that would potentially put the lives of her people at risk, she suffered from a serious case of self doubt. Ironic, really because she believes she is incapable of feeling love or of having a family yet she had both all along. I liked Reese up until about the last quarter of the book. Reese became reckless and a bit whiny, which surprised me because while I didn’t expect a perfect leader, this felt like an about face from where she was at the beginning. She kind of got on my nerves after that. Now on to the yummy men in Reese’s life. Is there anything hotter than a man that respects a woman’s capabilities as a leader? Yes, there is. TWO men who respect a woman’s capabilities as a leader. Sloan and Rylan couldn’t be more different. They’re like night and day. Sloan is stoic, humorless for about 90% of the story, devoted to Reese’s protection, and completely in love with her as well. He’s been friend zoned though, poor guy but he’s okay with it, until Rylan gets what he’s wanted since he met Reese. Rylan is a guy who loves to have a good time with the ladies, rarely takes anything seriously, has never been devoted to anyone (The closest he’s come is his friendships with his clan members), and has lusted after Reese since he first met her. Reese is the only thing these two men have in common and it takes some time, and a very hot encounter between the two before they’re on the same page. I liked both men because they respected Reese as a leader, they didn’t try to “mansplain” anything to her (If you don’t know what mansplain means google it, it’s a real thing). So naturally, the two men were perfect for Reese. Lucky woman. Ruled has the fast pace that I enjoy had but instead of focusing on just Reese, Sloan, and Rylan’s relationship like in the previous books, the plot moves the outlaws forward in what could be seen as the first steps towards another war, this time with the Council who has taken over the land and enforced laws that decide who gets what, who does what, and wants the outlaws stomped on like insects. I really hope there are more books in this series because aside from seeing Connor and Hudson still happy in love, Hudson’s twin brother Dominik makes an appearance and a decision that puts his life at risk. Not gonna lie, I have a little crush on Dominik and would love to see him have his own story. There’s a lot that was left unresolved in terms of where the outlaws stand after some major events and I would really love to see them take the next step and for Kennedy to give other supporting characters their shot at a bit of happiness. And while Ruled can be read as a standalone, there are some events that happen in the first books that have a bit of an effect on this book’s plot. I would recommend reading the series in order.